As I may have mentioned once or twice, I love ginger. I could happily have lived on Old Jamaica Ginger Beer as a child (if only my parents had let me!). And I confess that as a student I once stood in Tesco and worked out that Ginger Wine was the cheapest way to get drunk (note to students: this research was half a century ago, and may no longer be true). So when Berry Bros & Rudd asked if I’d like to try some of The King’s Ginger liqueur, it wasn’t very hard to say yes! I’d initially assumed that this was just a fancy ginger wine and I suppose in a way it is – in the same way that a 30 Year Old Port Ellen is just a fancy version of Bells. Don’t be fooled, though. This is a proper spirit – bottled at 41% ABV, in sharp contrast to those 14% ginger wines – and deserves some serious respect, which explains the whisky glass. As well as being as strong as a whisky, it looks very similar in the glass; a nice straw gold colour, albeit with the kind of thick legs you’d never normally see in a dram. The nose is powerful – lots of alcohol heat and at the same time a big hit of warm ginger too, although neither aroma becomes overwhelming. There’s a dark honey note, and candied orange peel. In the mouth, the first thing that strikes you is its syrup nature – it’s a little like drinking honey, in a really good way. It’s very sweet and sticky, and then the ginger heat comes along and cuts through that syrup nicely. There’s also a nice bitter edge that comes through later on, which helps to balance it out and prevent it being too sweet. I could happily drink it neat – although probably only one glass, perhaps with dessert, as it’s superbly rich – but it’s marketed as a mixer too. 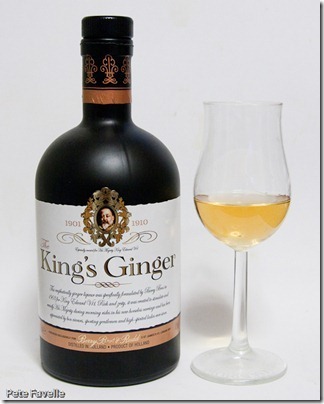 Seasonally, Berry Bros & Rudd suggest The King’s Ginger Summer Cup as one to try, so after some hasty shopping I do. I have to confess that I don’t obey the full instructions, having neither ice, lemon wheels or strawberries to hand but I hope you’ll forgive me. 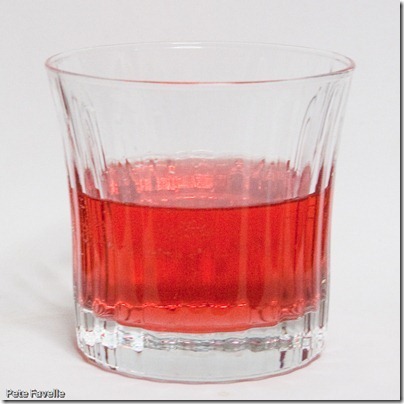 Ok, so the cranberry makes it look a little like cough mixture and the smell is slightly reminiscent too – fruity with that faint astringency that ginger can give. But I have to say I like it. A lot. 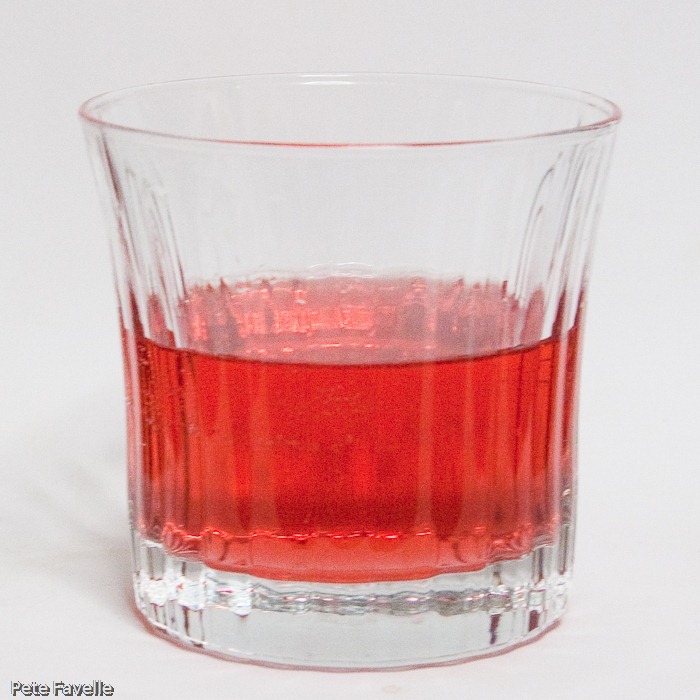 It has gentle ripe fruit, a little fizz from the lemonade, some subtle ginger heat and thanks to the natural sharpness of cranberries and the use of Fever Tree (a lemonade that isn’t overly sweet) it manages to avoid becoming a posh alcopop. To be fair, in our limited tasting group I’m in the minority. My incredibly sweet-toothed wife declares it – well, I can’t use her actual words but she isn’t a fan! If, like her, you dislike sharpness and bitterness in your cocktails it’s probably worth digging out a different recipe to try. But if, like me, you want something fruity, cold and refreshing for a summer evening, this is an excellent start. I can’t leave it at one cocktail though. Berry Bros & Rudd also propose a very special Whisky Mac, using their own whisky. Happily I have some of this in the cupboard. They don’t specify which to use, so I select the Glenrothes 1988 – it is for a Royal Whisky Mac, after all! 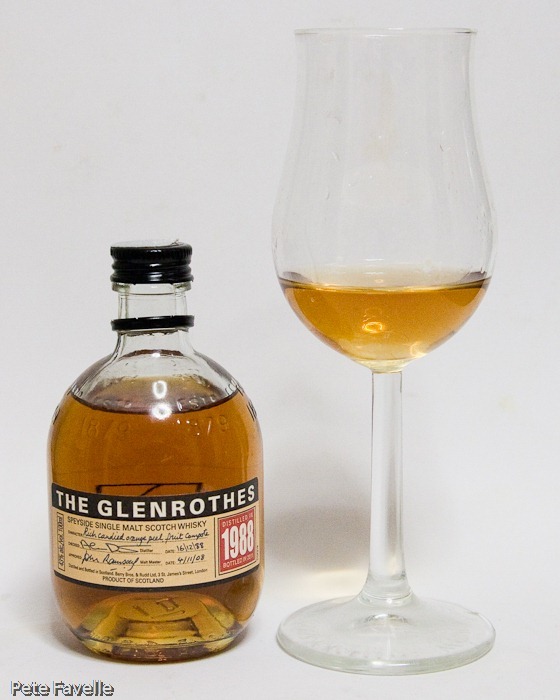 The 50/50 balance seems to work well with The King’s Ginger – there’s still plenty of ginger heat on the nose, but it balances nicely with the wood from the Glenrothes and they both bring some nice citrus notes. In the mouth, it’s magnificent. Big, bold whisky flavours balanced deliciously by the syrup of the liqueur and the ginger heat coming through later on, leading into a lingering, alcohol filled and very pleasant finish. Easily the best Whisky Mac I’ve tasted, albeit also probably one of the most expensive! Berry Bros & Rudd kindly provided Pete Drinks with samples of The King’s Ginger and The Glenrothes 1988.